Of the multitude of comic book universes that cropped up during the 1990s boom, the Ultraverse line from Malibu was perhaps the most worthy of sticking around. It was all original, unlike Valiant, which built off of Gold Key characters from a decade before, and its cast of players was diverse, fairly well-planned, and not prone to the proprietary firewalls that kept the Image characters from fully integrating. 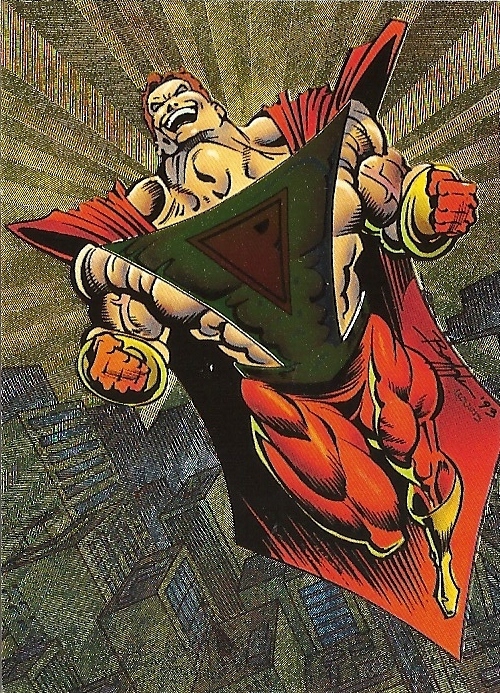 Sure, many of the Ultraverse’s heroes and villains were derivative, but that’s the curse of comics — like the periodic table of elements, there are only so many ingredients that go into the creation of someone in tights and a cape. You can give them a break on that score. 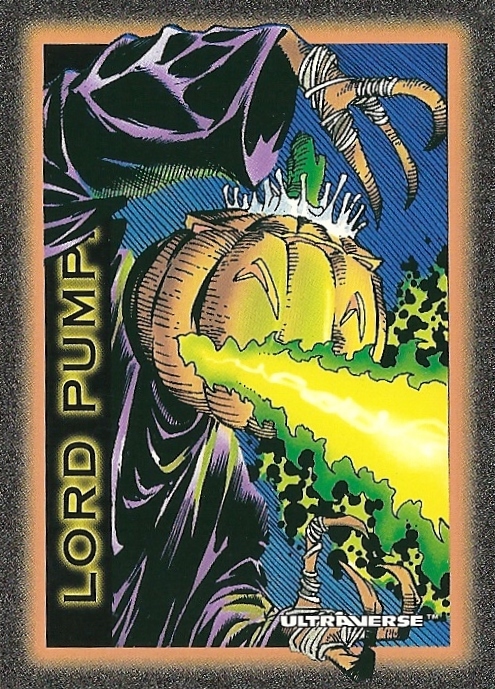 To go through some of the Ultraverse storylines is the topic for another post, but suffice it to say, it left its core of fans wanting more. 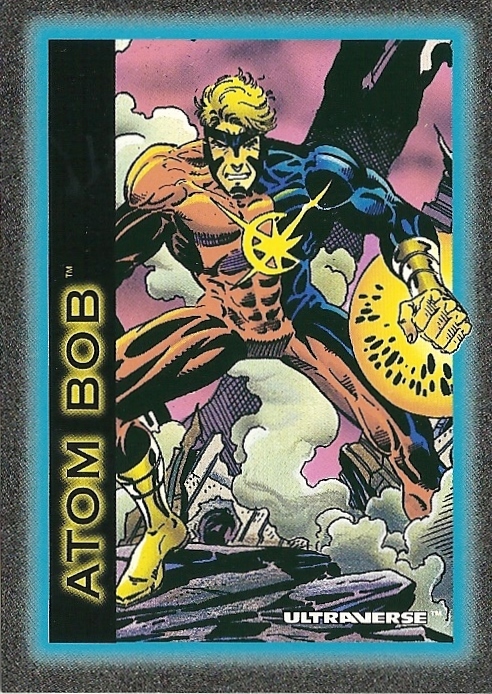 But because Malibu got into the hero business at the tail end of the boom, the Ultraverse didn’t have long before the Big Bang became the Big Bust (and Marvel purchased Malibu and neutered the IP). This brief window didn’t stop the company from — in conjunction with SkyBox — putting out three, count ’em three, editions of trading cards, though. And, thrill of thrills, today we’ll have a look at the first. There were 100 cards in the maiden set, with three tiers of chase cards tacked on. I opened a box a couple of months ago, and was able to flesh out one complete set and roughly half of the chase cards, with several extra of the latter — for all those curious about the collation (all two of you). 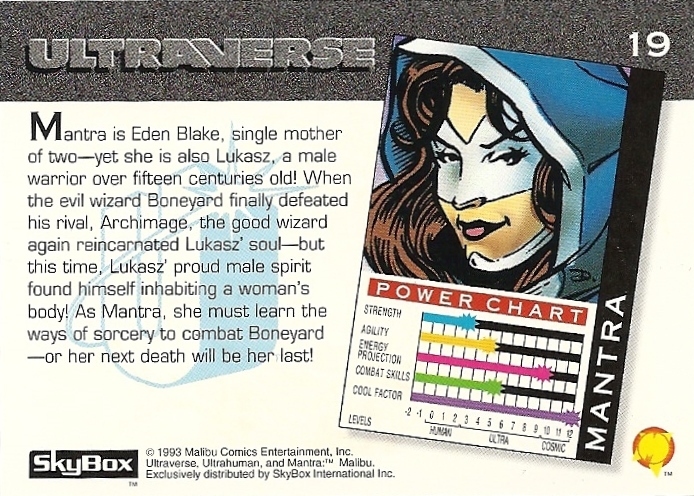 The base cards are mostly simple character cards, nothing more, nothing less, and a number of characters — the stars of the line — have multiple cards (there are also a few dealing with this universe’s tech). 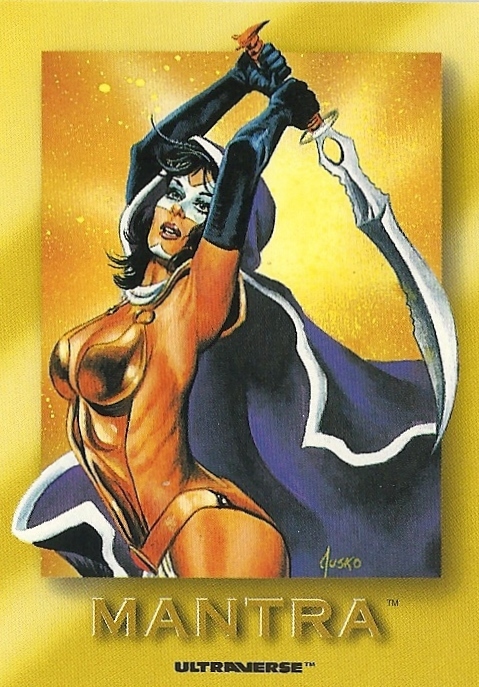 One of the treats with this set is that some significant names provide the art for many cards: Walt Simonson, Norm Breyfogle and Howard Chaykin to name a few. This is nice, though the drab, gray borders give them all the aesthetic of a cell block. I’m a bit out of my depth here. Moving on. Hey, he’s vomiting green flame. For cute! Can your precious Great Pumpkin do that, Linus? Huh? 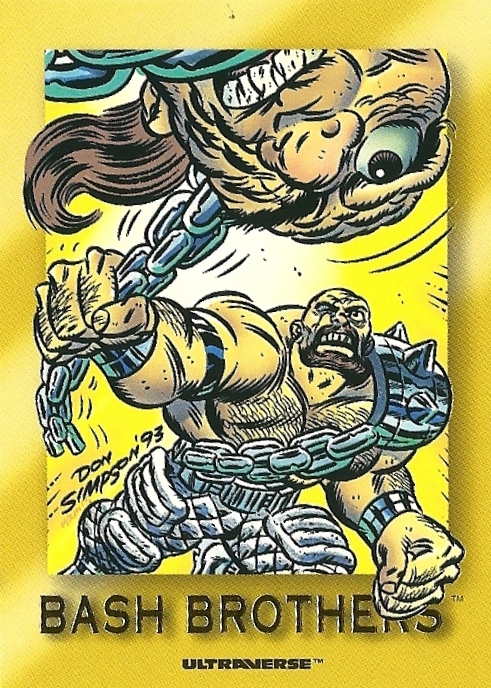 The Bash Brothers look like they combine the troglodytic brawn of the WWF’s Bushwhackers with the bug-eyed strangeness of Madballs. Mazel. I ran the coloring department for Malibu back then. We put out some good looking stuff but all of us were just learning. You wouldn’t believe the stuff I still have in my garage (if you liked Malibu comics). I’ve even got uncut printer proofs of these cards. 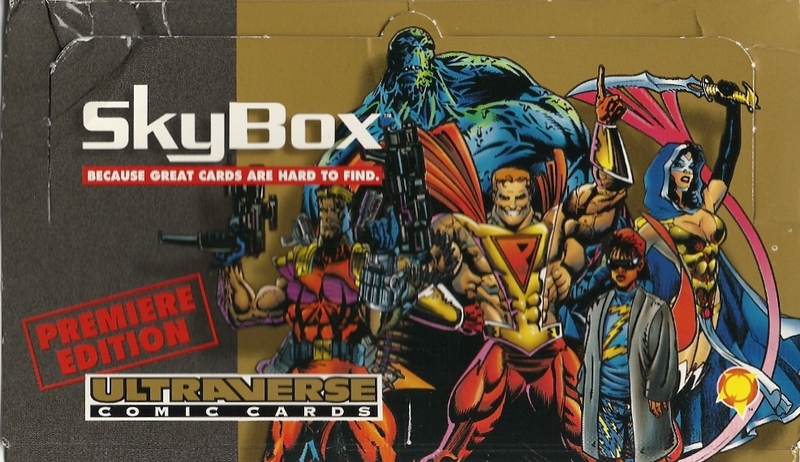 If you get this i love the ultraverse and would ve happy to buy some stuff off you.